Nova Scotia Duck Tolling Retriever Characteristics: The friendly and lively Nova Scotia Duck Tolling Retriever is a breed of medium sized dog, classified as a member of the Sporting Dog Group (AKC:2003). The Nova Scotia Duck Tolling Retriever, is characterized by its strong, compact, powerful appearance with a deep chested body and a playful expression. Other characteristics include brown to amber, medium sized, oval shaped eyes; high set, triangular shaped ears; a sloping luxurious tail and a springy, powerful gait. 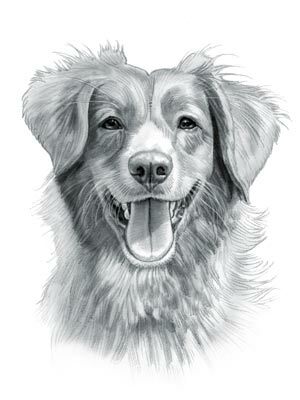 The temperament of the Nova Scotia Duck Tolling Retriever can be described as Courageous, Affectionate, Energetic. The coat type of the Nova Scotia Duck Tolling Retriever is described as hard, straight, water resistant coat in red, gold colors. Due to its characteristics and qualities, the Nova Scotia Duck Tolling Retriever demonstrated the desired traits of a Water retriever dog and decoy that is known by its nick name the "Toller". The origin of the Nova Scotia Duck Tolling Retriever dog breed was in Canada where it was developed in the 17th century. Nova Scotia Duck Tolling Retriever Breed Group and Dog Type - Sporting Dog Group (AKC:2003): The Nova Scotia Duck Tolling Retriever is one of the many breeds of dogs that belong to the Sporting Dog Group (AKC:2003). Other names for the Nova Scotia Duck Tolling Retriever: The Nova Scotia Duck Tolling Retriever is known by the nickname of the "Toller". Other names for this breed of dog include the Novie, Splasher, Yarmouth Toller, Little River Duck Dog, and the Tolling Retriever. Origin of the name: The origin of the name "Nova Scotia Duck Tolling Retriever" derives from its place of origin in Nova Scotia, a province in eastern Canada. The "Duck Tolling" element of its name refers to the noise made by the dogs splashing around that the curious ducks investigate - thus attracting attention like the tolling of a bell. The dog is a retriever and specialised in retrieving nets, ropes and lines for the fishermen and diving into the water to retrieve fish that had slipped from the fishermen's hooks. Nova Scotia Duck Tolling Retriever History and Origin: The country of origin of the Nova Scotia Duck Tolling Retriever breed was in Canada during the 17th century, where it was developed by Canadian hunters. The breed originated in the community of Little River Harbour in Yarmouth County, Nova Scotia (hence its alternative name the 'Yarmouth Toller'). The ancestors of the Nova Scotia Duck Tolling Retriever were European dogs combining the attributes of spaniels, retrievers, and the setters with the together with the the Dutch tolling Kooikerhondje and the, now extinct, St. John's Water Dog. The idea of developing the breed was taken from the Micmac Native Americans who hung up a fox skin on the shore which they would swing vigorously attracting the attention of waterfowl who become curious and approached the shore. French colonist Nicholas Denys (1598 – 1688) published the first documented description of the dog that would become known as the Nova Scotia Duck Tolling Retriever in 1672. The unusual role of the Nova Scotia Duck Tolling Retriever was to lure ducks and geese within range, and then retrieve them from the water. With the introduction of fast loading firearms in the 1770's the Nova Scotia Duck Tolling Retriever made the successful transition to the role of a Bird Dog (Gun Dog). The 'Yarmouth Toller' name was changed to the Nova Scotia Duck Tolling Retriever by the Canadian Kennel Club in the late 1950s and the FCI (Federation Cynologique Internationale) gave the breed full international recognition in 1982. The Nova Scotia Duck Tolling Retriever was officially recognized by the American Kennel Club (AKC) in 2003. Nova Scotia Duck Tolling Retriever Height: The Nova Scotia Duck Tolling Retriever breed is classified as a medium sized dog. The height to the shoulder of a male dog is 18-21 inches (45-54 cm). The height to the shoulder of a female dog is 17-20 inches (42-51 cm). Nova Scotia Duck Tolling Retriever Weight: The weight of the male in this medium sized dog is 44-51 lbs (20-23 kg). The weight of the smaller female dog is 37-44 lbs (17-20 kg). Nova Scotia Duck Tolling Retriever Coat Type: The coat type of the Nova Scotia Duck Tolling Retriever is described as hard, straight, water resistant coat. Nova Scotia Duck Tolling Retriever Coat Colors: The colors of this dog breed include red and gold colors. N.B. The term "Red" refers to reddish shades of orange, brown, and tan colors. Nova Scotia Duck Tolling Retriever Grooming - MODERATE Grooming Needs: The dog grooming needs of the Nova Scotia Duck Tolling Retriever is not extensive and therefore categorized as Moderate in order to maintain a healthy coat, reducing the risk of skin infections. The modest grooming needs of the Nova Scotia Duck Tolling Retriever is considered to be mid-maintenance requiring weekly brushing and combing. Dog Grooming Requirements should include bathing the dog on a monthly basis and making regular inspections of the teeth, eyes, nails and ears. Nova Scotia Duck Tolling Retriever Litter Size: The litter size of this dog breed ranges from 6-10 puppies. Nova Scotia Duck Tolling Retriever puppies for sale can be obtained reputable breeders and from rescue centers. The cost of Nova Scotia Duck Tolling Retriever puppies varies depending on location, pedigree history and the dog breeder. Nova Scotia Duck Tolling Retriever Temperament and personality: The temperament and personality of the popular Nova Scotia Duck Tolling Retriever dog breed is described as Friendly, Courageous, Affectionate, Energetic and Lively. Nova Scotia Duck Tolling Retriever Exercise Requirements: The exercise requirements of this breed of dog are moderate. The Nova Scotia Duck Tolling Retriever requires regular daily exercise consisting of about one hour every day. This medium sized dog has a springy, powerful strident gait with strides of a moderate length requiring a steady walking or jogging speed by the owner to meet the dogs exercise requirements. If the dog has more energy than you do, then teach your dog to play ball in a chase and catch game. Nova Scotia Duck Tolling Retriever Diet: A fully grown Nova Scotia Duck Tolling Retriever should be fed twice a day. A diet consisting of a premium dog food can be balanced with fresh food eaten by the family. The question is What Can Dogs Eat?. Check out our comprehensive list of what dogs can and what dogs cannot eat. Nova Scotia Duck Tolling Retriever Health Problems: Potential health problems of the Nova Scotia Duck Tolling Retriever breed include Eye Problems, Hip Dysplasia, Gastric torsion . Resolving health problems can prove to be expensive and it is always wise to obtain pet insurance or dog health insurance when buying a dog. Is the Nova Scotia Duck Tolling Retriever dog breed said to be Hypoallergenic? Answer: No. Nova Scotia Duck Tolling Retriever Lifespan: The life expectancy of dogs vary according to the size, breed of dog and any serious health problems. The typical lifespan of the Nova Scotia Duck Tolling Retriever breed is 12-14 years. Nova Scotia Duck Tolling Retriever Male Dog Names: Male Dog names are most often chosen to reflect favorite names of the owner or the strength, size, coloring and country of origin of the Nova Scotia Duck Tolling Retriever breed. To give you some inspiration regarding good male Nova Scotia Duck Tolling Retriever names our small selection might be of help with naming boy dogs. Our top male dog names are: Monty *** Jasper *** Merry *** Varrick *** Spence *** Trace *** Checker *** Max *** Jaxon *** Merlin. Nova Scotia Duck Tolling Retriever Female Dog Names: Female Dog names tend to be softer, prettier and reflect the temperament of the girl dog. Our top choice of good female Nova Scotia Duck Tolling Retriever names are Sally *** Cutie *** Kerry *** Rosie *** May *** Victoria *** Loulou *** Cherry *** Tanny *** Bessie.